The students Mitchell Technology Institute have the option of pursuing one of 30 on-campus academic programs and 6 online programs, and enjoy a 99 percent job placement rate after graduation. Admitted students with a good academic record may be eligible for the Star Scholarship, which awards $1,000 for the first semester. The school will double the amount of this scholarship for recipients who enroll in one of their spotlight programs. For the 2013-2014 school year, 41 percent of MSI students qualified to receive the Pell Grant, with the average award amounting to $4,103. The average first-year financial assistance package is $9,716. The first technical school in South Dakota, Lake Area Technical Institute was founded in 1965 and now offers 29 programs to its more than 2,000 students. Forty-four percent of LATI students received the Pell Grant for the 2013-2014 school year. The average grant amount was $4,192. Students can apply for the following scholarships: Graco Foundation Scholarships ($2,000 for Precision Machining students), South Dakota Bankers Foundation Scholarship ($1,000 for Financial Services student), Ortwin Buss Family Scholarship ($1,000 for Ag or Diesel Tech student), and the Jack & Maisie Barrick Memorial Scholarship ($1,000 for Machine Tool Technology student). The Otter Tail Power Company Scholarships award $1,000 each for students in Electronics Systems Technology, Energy Technology, Machine Tool Technology, Robotics, and Welding Technology. The state's flagship university and also its oldest (established in 1862), the University of South Dakota has an undergraduate student enrollment of 7,633 (Fall, 2014) and is home to the only law school, medical school and accredited business school in South Dakota. All entering freshmen who apply for fall admission are automatically eligible for the Coyote Commitment Scholarship Program ($3.500 per year). The Presidential Alumni Scholarship considers academically outstanding students and awards scholarships of up to $7,000 per year. Beginning students of American Indian heritage may be eligible for the Glenn E. & Barbara Ullyot Lakota Scholarship (up to $20,000 over four-years). Journalism majors may be considered for the Al Neuharth Scholarship for Excellence in Journalism ($5,000 per year). Augustana University, a Lutheran-affiliated school founded in 1860, offers more than 100 majors, minors, and pre-professional programs for undergraduates. Every student receives some sort of academic, talent, or need-based financial aid, and on average, first-year students receive an aid package valued at about $26,000. The college awards scholarships to first-year students based on their high school GPA and ACT or SAT scores. Top students get an $18,000 scholarship, and all qualifying students receive at least $13,500. More than 85 percent of Augustana students graduate in four years, which also helps to limit the amount of money needed for college. Traditionally, tuition is low at South Dakota’s public universities and two-year technical institutes. But after adding other education expenses to the mix, college in the Mt. Rushmore State might not seem so affordable. Federal grants and loans and state financial aid can help you avoid student loans, but the best method to reduce your bill is by standing out in high school, since several scholarships reward exemplary secondary school students. 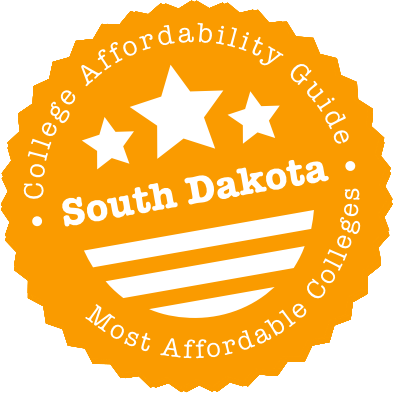 Regardless of how you performed in high school, keep reading to find other routes to a cheap college education in South Dakota. South Dakota makes it simple for students to transfer college credit between state institutions. All general education course credit hours transfer, and South Dakota offers statewide common course numbering to facilitate transfer as well. Students with an associate degree can transfer their degree seamlessly to a bachelor’s degree program. Students in South Dakota will find that the state offers a generous general education transfer policy. As long as institutions are accredited by the North Central Association of Colleges and Secondary Schools, all general education course credit hours that fulfill graduation requirements will transfer. Students with an Associate of Arts will have a transferable degree. Associate of Science degrees are terminal. However, both types of associate degree can be transferred under specific degree articulation agreements. Typically, students with an associate degree will have completed the general education requirements for a four-year degree. South Dakota also has a number of program-to-program articulation agreements that simplify degree planning for students. With these agreements, you can see how courses are mapped out between two different institutions. Learn more about South Dakota transfers from the South Dakota Board of Regents website. There, you can find articulation agreements, course equivalency guidelines and program-to-program agreements. Whether you’re looking to attend a South Dakota college or you are heading to a school across state lines, look for funding at the South Dakota Board of Regents. It administers scholarships and endowments for nearly 20 schools, both public and private. (In addition, three “university centers” allow students to attend courses online or in-person from public universities at affordable rates.) The Board of Regents website lets you know all about tuition reduction programs at the state’s public universities for everyone from senior citizens and visually impaired students to graduate assistants and state employees. The website also features detailed comparisons of college costs and academic programs at the six public universities, as well as information on tuition reciprocity agreements with Minnesota, North Dakota and Wyoming. Elsewhere, Western Interstate Commission for Higher Education (WICHE) can help you identify cheap tuition opportunities in other states. Select Dakota, one of the Board of Regents’ initiatives, walks you through the steps of getting ready for college. After you identify as a middle schooler, high schooler, transfer student or adult learner, it gives you specific information about how to prepare academically and financially for your postsecondary path. One thing it might suggest is saving with a CollegeAccess529 account, which earns compounding interest. Alternatively, if you’re going for an associate degree or certificate, acquaint yourself with the state’s four technical institutes at the South Dakota Department of Education Division of Career & Technical Education. Summary: Students facing the biggest gaps between college costs and incoming financial aid have one last resource: a $500 to $2,000 grant from the state. Eligibility: South Dakota residents at participating colleges in the state are eligible. How to Apply: Just submit the FAFSA. Your college’s financial aid office will take care of the rest if your level of need is high enough. Summary: Three hundred students a year get a full ride (tuition, fees and books) to a state technical institute, provided they stick around South Dakota to work for three years after graduation. Eligibility: Students from across the U.S. can apply. They must have certification, work experience or dual credits from high school in the area they’re set to study. Recipients are chosen based on financial need, academic transcripts and program availability. How to Apply: Get accepted into an eligible program. Then apply online for the scholarship after January 1st. Submitting an application early works in your favor, but remember: You must submit a FAFSA to complete the application. Summary: Undergraduate upperclassmen in an elementary or secondary education program can get a scholarship. The only catch? They must stay in South Dakota for five years after graduation to teach a critically needed subject. If they don’t, the scholarship turns into a loan with interest. Eligibility: Students need not be South Dakota residents, but they must attend a four-year college or university in the state and hold both a 2.8 cumulative GPA and a 2.8 GPA within their major. Scholarship amounts are based on remaining financial need after factoring in other aid sources. How to Apply: The application goes online in December, and you have until mid-April to apply. If you receive the scholarship, within a year after graduation you must verify employment as a South Dakota teacher in a critically needed subject. Summary: Dakota Corps is South Dakota’s way of telling high school graduates it wants them to stay. The state rewards students with a full scholarship (tuition and fees) to attend a participating college if they opt to work in a critical need occupation in the state for two to five years after graduation. Eligibility: To qualify, students must have a GPA of 2.8 from a South Dakota high school to go along with a 27 or higher on the ACT. They also cannot take more than a year off after high school before going into college (unless they stop off at the military). Students who meet these criteria are then judged based on the strength of their application. How to Apply: Mail your signed Dakota Corps Scholarship application to the South Dakota Board of Regents by February 1st. It includes GPA and standardized test scores that a high school administrator must certify. You must also discuss your extracurricular activities and community service and write an essay. Successful applicants receive an acceptance form to give to the college, which then decides whether to honor the scholarship. Summary: This fund went on hiatus in 2014, but when it is active, it provides up to seven $6,000 scholarships to American Indian tribe members from South Dakota. Eligibility: South Dakota high school graduates are eligible to apply if they’ve been out of school for fewer than five years (or active military duty for less than one) and are attending an accredited college, university or technical institute in the state. How to Apply: Submit a Hagen-Harvey Scholarship application to the South Dakota Board of Regents along with two letters of recommendation, high school transcripts, ACT scores, resume, documentation of tribal status and a personal essay. Summary: Graduate high school within three years and get a “jump” on college with a nice little $1,500 scholarship toward freshman year studies. Eligibility: Graduates of South Dakota public high schools are eligible. They must enroll full time at a South Dakota college accredited by the North Central Association within one year of graduation unless they join the military first. How to Apply: Upon being admitted to a college program, have a high school administrator sign a short application form, and mail it to the college’s financial aid office. Summary: Banking on a career in finance or business after graduation? The South Dakota Bankers Foundation wants to help. It provides four $3,000 to $4,000 scholarships to college juniors in the state. Eligibility: Students must be interested in banking, finance or business. Beyond that, applicants are judged based on standard measures such as GPA, test scores and community service. How to Apply: Mail an application to the South Dakota Bankers Association along with your college transcripts and two letters of recommendation. Applications are due in early March. Summary: Top performers in high school get rewarded with $6,500 over four years toward college. Eligibility: South Dakota residents who nabbed a 24 on the ACT and took home a 3.0 cumulative GPA during high school should apply if they’re set to enroll as a full-time student at a participating school. How to Apply: Mail an Initial Eligibility Application Form to your chosen college along with transcripts and a copy of your ACT score. You must maintain a 3.0 in college to keep your funding. Summary: Agree to see patients with Medicaid or take part in the Dakota Smiles Mobile Dental Program for children, and have $40,000 to $100,000 in student loans wiped clean. Eligibility: South Dakota-based dentists with student loans are eligible, provided they have no conflicting service obligations. Candidates are chosen based on the strength of their applications, with applicants who practice in critical need areas getting an edge. How to Apply: Mail an application to Delta Dental of South Dakota Foundation along with loan documents, personal essays, dental school transcripts and two letters of recommendation. Shoot for one of three application deadlines: May 1st, September 1st or November 1st. Summary: The six public state universities make specific programs available at three university centers in South Dakota, which provide hybrid in-person and online instruction. The price tag for this instruction is 50% less for military members. Eligibility: To receive reduced tuition, students must be in the military and be enrolling in an undergraduate program. How to Apply: Complete an application and submit it along with proof of military service to the state university you enroll in. Summary: Those who defend and protect South Dakotans as National Guardsmen earn plenty of respect alongside some cool benefits. One of them is 50% off undergraduate or graduate tuition at a state-run university. Eligibility: Members of a South Dakota National Guard unit who have completed basic training qualify, as long as they remain in their unit while attending college. How to Apply: After you’ve been accepted to a program, contact the South Dakota Army National Guard Education Service Office to start the reduced tuition application process. It will involve submitting South Dakota National Guard Form 56. Summary: A 100% tuition waiver is available to children with a parent who died in combat. Eligibility: The deceased parent must have resided in South Dakota for at least half a year before being called into active service. The child must be under 25 and headed to a state public university or technical institute. Under a separate but similar program (with the same application), children under 25 and spouses of National Guardsmen who died or were disabled because of duty also qualify for a tuition waiver, as do children and spouses of prisoners of war and soldiers missing in action. How to Apply: Mail the Veteran’s Dependents or Survivors Application for Free Tuition to the South Dakota Department of Veterans Affairs for verification. When you get it back, bring it to your school’s registrar to receive the tuition waiver. Summary: Although the federal government provides scholarships for ROTC members, the state has its own program for when federal funding is unavailable. The program allows upperclassmen with the rank of senior ROTC cadet to receive a 50% reduction in tuition for their final four semesters. Eligibility: South Dakota residents attending one of the five South Dakota schools with an ROTC program are eligible. How to Apply: Contact your university’s ROTC representative to get application instructions. Summary: Full waivers are up for grabs for veterans headed to state schools, and partial ones for those going to a university center or enrolling online. Eligibility: The veteran must be an honorably discharged South Dakota resident who served in qualifying combat. How to Apply: Fill out the Veterans Application for Free Tuition at State-Supported Schools, and submit it along with a DD-214 to the South Dakota Department of Veterans Affairs. Summary: Children of those who died protecting South Dakotans from fire, violence and health emergencies get free undergraduate tuition at the state’s public universities. Eligibility: Children must have been under 21 when their parent died, and the death must have been due to the parent’s occupation. How to Apply: Upon being admitted to a program, submit a short form to the registrar’s office with a copy of the death certificate. Summary: High school upperclassmen can take state university classes for less than $50 a credit. Eligibility: The Board of Regents uses a basic formula to determine eligibility, with three factors considered: GPA, class rank and ACT score. How to Apply: Submit an application between April and August. You must also register for an eligible course. Summary: South Dakota teachers who need undergraduate or graduate coursework to renew their certification or maintain employment can get 50% off tuition at any of the five state schools with education programs. Eligibility: Certified teachers with a signed contract in South Dakota are eligible for a cheaper tuition bill, provided they keep a 3.0. How to Apply: Complete an application and get it signed by the school superintendent before submitting it to the college’s registrar. This should happen before class registration. Reapply each semester. Summary: Graduate students who’d prefer to pay in-state tuition have six public universities in South Dakota to choose from, but with WRGP they can expand their choice to 60 schools across the western United States. Eligibility: To qualify for resident tuition, students must be legal residents of a state in the Western Interstate Commission for Higher Education (WICHE) who have won a place in a qualifying program. How to Apply: Enroll in an eligible program, and clarify that you’re requesting the WRGP rate. Summary: Sometimes, undergrads stick around for college because in-state tuition is so much cheaper than the out-of-state rate elsewhere. WUE eases the financial burden by setting South Dakotans’ tuition at participating schools at 150% of the in-state rate. Eligibility: To qualify for reduced tuition, students must be legal residents of a WICHE state who are enrolling in a qualifying undergraduate program. How to Apply: Just get accepted into an eligible program and ask for the WUE rate. Schools do have discretion over funds, and some limit the number of WUE scholars each year. As its name implies, South Dakota’s Department of Social Services (DSS) is the center for government-funded social services in the state. It houses everything from Medicaid and the Children’s Health Insurance Program to the Supplemental Nutrition Assistance Program (food stamps) and the Child Care Assistance Program. All of these programs bring essential services to individuals and families with limited assets. In the following sections, we’ll explore other methods to snag affordable rent, pay less toward utility bills, take advantage of free campus-based clinics, utilize cheap transportation, sniff out area food pantries, and lower child care costs. You can turn to a city or county government to apply for benefits or contact a community action agency, which will walk you through the process. But don’t stop there. The state’s Helpline Center is the most comprehensive resource for services there is, compiling governmental and nonprofit programs designed for low-income residents. It’s an essential reference for students, regardless of where you live in the state. Depending on where you go to school, you may have the option of living on campus. Only one of the state’s four technical institutes (Southeast Tech) has on-campus housing, and it can accommodate fewer than 10% of students. The state’s four-year universities are accustomed to providing student housing because the South Dakota Board of Regents requires underclassmen at public universities to live on campus unless they qualify for an exemption (e.g., they are married or live with parents in the area). If campus housing is an option for you, consider it. For starters, it is a great way to adjust to student life. But it also provides an easy way to cut expenses because campus residence halls and apartment prices are inclusive of utilities, internet and furniture — and nearly eliminate the need for transportation. And if you’re coming up with reasons not to, look again. Have kids? South Dakota State University has family housing that may be cheaper than an average apartment in town (especially when you consider utility costs). Don’t want to have to move out in the summer? Some schools, including Southeast Tech and University of South Dakota, make it easy and affordable for students to stay on campus from May to September, thereby eliminating moving costs and utility setup off campus. Use an online calculator to estimate what you’d pay in a campus residence compared to off of it. Overall, South Dakota has a manageable cost of living. Of course, housing costs vary in different parts of the state, with tiny Aberdeen cheaper than touristy Rapid City, and Sioux Falls somewhere in between. All of which is to say that getting a place off campus won’t cost too much. Some schools will even help you do it. Mitchell Technical Institute posts a detailed listing of off-campus houses and apartments within a 20-mile radius and helps students find roommates via its student housing page. South Dakota School of Mines and Technology features not only a housing search engine on its website, but also a list of questions to ask potential landlords. And don’t forget costs not directly related to housing. Schools like Northern State University have commuter meal plans so you can have an affordable dinner when you’re too busy to cook. If you’re exploring the commuter option, supplement the options on your school’s off-campus housing webpage with apartments and homes from SDHousingSearch.com. CampusRent.com also has up-to-date listings of area apartments. If you’re facing a gap in housing, using a shelter temporarily is always an option. The Department of Veterans Affairs keeps a list of shelters in the state. You’ll have to set up electricity and, potentially, natural gas service through your local utility company or a municipal electrical utility. Your landlord can point you in the right direction. When your place is hooked up, the price shock should be minimal. Electricity rates in South Dakota are typically below the national average, thanks in part to the region’s ability to generate wind and hydroelectric power. That doesn’t mean some people don’t need help paying the bills. If you’re one of them, the state funds two utility assistance programs. The first, run by Office of Energy Assistance (part of DSS) is the Low Income Energy Assistance Program (LIEAP). It covers a portion of residents’ heating bills, whether that’s through natural gas, electricity, propane or fuel oil. The second, administered by community action agencies, is the Weatherization Assistance Program. It’s also for low-income residents and pays the cost of repairing a home to minimize energy usage, thereby decreasing utility bills. You can apply for both programs at the DSS website. The biggest and best hospital in the state is the Sanford School of Medicine at University of South Dakota. The region is dotted with Sanford buildings, but the main one, Sanford USD Medical Center, is in Sioux Falls. The smaller Sanford Clinic Vermillion is right on the USD campus in Vermillion, where it offers several free and discounted services to students, including acute care visits, immunizations, labs, physical exams and STD tests. Your school doesn’t need a hospital attached in order for you to get quality care. A clinic will do just fine. Students at Dakota State University, for instance, can visit a clinic nurse as much as they want for acute care, and they get three free visits a year with a physician. Unfortunately, the state’s technical institutes do not have campus health centers. However, like most schools, they generally provide free access to trained counselors. Look to South Dakota State University and Lake Area Technical Institute for examples of what’s available. Of course, bigger medical problems require a trip off campus, and even if something in your body is temporarily broken, you don’t want to permanently break your budget. That’s where community health centers come in. They use sliding scale rates to provide care at costs anyone can afford. Get a full list using Get Covered South Dakota’s locator tool. The same concept exists for community mental health centers. If you’re a member of a tribe, you’ll also want to consult the Great Plains office of the Indian Health Service for subsidized physical, mental and dental healthcare. Speaking of dental care, there are no fully fledged dental schools in South Dakota, but there is a dental hygiene department at USD. It operates two clinics — one in Vermillion and one in Sioux Falls — that offer basic services at costs much lower than outside dentists (because students are performing them). You won’t be able to get fillings, but cleanings and X-rays are a go. For oral care in other parts of the state or other parts of your mouth, discover low-cost options at FreeDentalCare.us. Day care or preschool is a must for college-bound parents. While campus-based child care facilities are pretty common, they serve different ages. For instance, Lake Area Technical Institute Educare Center is a day care facility exclusively for students with children under three, whereas Scarbrough Childcare Center at Southeast Tech has a more expansive offering, with a preschool for three- to five-year-olds to go along with its infant and toddler program. The University of South Dakota has one of the best facilities. Its Vucurevich Children’s Center maintains three separate programs — one each for preschoolers, toddlers and infants — and publishes discounted rates for students. Those with no means might qualify for the USD Head Start program on campus. If you’re not at that point, a subsidy through the state’s Child Care Assistance Program might be enough. You can use it toward a licensed child care center found via the state’s Child Care Provider Search or Helpline Center‘s search tool. Depending on your distance from campus, you may have to bite the bullet and budget for a car. Outside of Sioux Falls, South Dakota does not have strong public transportation systems, mainly because it’s sparsely populated. Still, it’s worth exploring the options. Sioux Area Metro goes to all the area colleges, but doesn’t advertise student discounts. That shouldn’t stop you from buying a bulk pass and saving money that way. The Rapid Transit System and Aberdeen’s Ride Line are also cheap but have limited routes and vehicles. In fact, to use Ride Line, you’ll have to make an appointment the day before. One solid option for budget-conscious students in Rapid city is B-cycle, a bike share program. Mines students can get a yearlong pass, with a discount off the full rate. Although hunger is increasingly a problem on college campuses, South Dakota schools are behind the curve when it comes to establishing food pantries. There are none. That leaves students in the same boat as other residents, who look to local nonprofit organizations for food assistance. Many run pantries, which you can find at FoodPantries.org. Pregnant and nursing mothers can supplement what they receive at a neighborhood pantry with free nutritious staples from the grocery store through the South Dakota WIC Program. Sioux Falls is the place to be in South Dakota. The city’s two biggest employers are both nonprofit health systems, resulting in lower-than-normal medical costs for city residents, including Southeast Technical Institute enrollees. Most of the benefits extend at least an hour down I-29 to Vermillion, home of University of South Dakota. Housing is also reasonably priced in Sioux Falls, both for renters and homeowners, although utility costs are noticeably higher than elsewhere in the state. Students at Southeast Tech and other area schools won’t have to worry about that if they apply for campus housing. Campus living will save them money on a school commute, but should they choose to live in the city, the Sioux Area Metro is cheap and reliable. With routes starting at each area school, it’s also convenient. The City of Sioux Falls has a reasonable assortment of services for a small city. For residents in search of cheap healthcare, it runs four clinics under the Falls Community Health name. The clinics provide primary and dental care on a sliding fee scale. Inter-Lakes Community Action Partnership has an office in Sioux Falls, from which it enrolls low-income residents in government-funded programs or in its own initiatives. There’s Head Start for free child care, Heartland House for transitional housing and ICARE for home heating subsidies, just to name a few. Lutheran Social Services of South Dakota runs all sorts of low-cost child care programs, including after-school and summer programs for older kids, but it also has adult programs. For example, its Financial Fitness Education Series is ideal for Sioux Falls residents who want to master the college financial aid process and keep their debt low. Sioux Falls Area Community Foundation has loads of scholarships to apply for, whether you’re going to a four-year university or to a technical institute. Although most of the awards are for students graduating from area high schools, some are open to students across the state. Think that’s all there is in Sioux Falls? Not even close. Flip through Helpline Center’s online directory for more. Rapid City has a bit of a tourist economy, seeing as it’s the closest decent-sized city to Mt. Rushmore. Heck, it’s the only city within 300 miles. The isolation comes with certain costs. Healthcare, though cheap and plentiful in Sioux Falls, costs more in Rapid City, as do groceries. Public transportation is basic and gas prices are fairly low, meaning most people opt for cars. But fitness-minded students at South Dakota School of Mines and Technology can hop on a bike to class through B-cycle, and other area students can get an annual pass. Considerable savings can be found in housing—affordable apartments are usually available. Black Hills Area Community Foundation has eight scholarship funds, and although you won’t qualify for all of them — as several are earmarked for graduates of specific high schools — it’s worth applying to those you are eligible for. After all, the foundation exists to give out money. Why not to you? Pennington County Health and Human Services is there for when all else fails, with an Economic Assistance program to give money for rent, groceries, transportation and utilities, as well as necessary medical bills and prescriptions. Pennington County Housing and Redevelopment Commission is taking applications for its nearly 500 rent-controlled apartments, but you’ll have to be making some income to qualify. It also facilitates the region’s Section 8 Housing Choice Voucher Program, which lowers the cost of renting for residents with limited financial resources. Western South Dakota Community Action is about giving low-income residents west of the Missouri a shot at a comfortable life. For example, it distributes staple food items every month as part of its Nutrition Assistance program, helps residents minimize their tax burden and maximize their return, and signs eligible citizens up for the state’s Weatherization Assistance Program. Its website leaves a lot to be desired, but its programs don’t. Go in or give the agency a call to see what you qualify for. Youth & Family Services has a huge service area covering the western half of the state, but its main office is in Rapid City. From there, it runs a child development center with year-round programs for infants through fourth graders, including full-time child care and before- and after-school programs with discounted rates for families with little income. To go in-depth on social services in the area, consult United Way of the Black Hills. It has a list of over 50 agencies it works with, one of which is Helpline Center. Aberdeen is a little less isolated than Rapid City. It’s positioned in the northeastern corner of the state about a three-hour drive from three small cities: Sioux Falls, Bismarck and Fargo. That’s enough to give residents access to affordable healthcare and allow them to buy groceries without paying a markup like Rapid City residents. Consistent with the rest of the state, housing in this town of 26,000 is also cheap. Northern State University students can get an even better deal by living on campus or at least taking advantage of what campus has to offer, including free basic healthcare. Aberdeen Family YMCA is a great place to go for child care, considering there’s no day care on Northern State’s campus. Between the Learning Tree Preschool and Uproar, its after-school program, all your children have a place to learn while you’re studying. Aberdeen Housing Authority is the place to go for subsidized rent. If you qualify, you can either walk away with a Section 8 Housing Choice Voucher good toward rent at an area home or move into one of the Authority’s own rent-capped apartments, town homes or houses. Brown County Welfare Department is a last resort for county residents, so look elsewhere first. If needed, however, the department is there to give funds on your behalf directly to landlords for rent, to utility companies for bills or to hospitals and clinics for healthcare needs. GROW South Dakota is a portal for applying to local income-qualifying initiatives, such as the Weatherization Assistance Program, the Commodity Supplemental Food Program and emergency assistance, should you suddenly be without money for rent or other basic necessities. Helpline Center can help you sort through more services in Brown County and beyond.